The front of the office building for Blockchains, LLC, a company that purchased about 67,000 acres of land in the Tahoe-Reno Industrial Center in January. (David Calvert/The Nevada Independent). After purchasing about 67,000 acres of land in Northern Nevada last year, a little-known blockchain company pledged Wednesday to hire 1,000 new employees by 2021 during a tour of its initial offices. The company, known as Blockchains, LLC, has been the subject of intense speculation and remains quiet about what it plans to do with enough land to build a small town. In January, Blockchains, LLC closed on 67,125 acres in Sparks at the Tahoe-Reno Industrial Center (TRIC), more than 22 times as much land as Tesla bought for its Gigafactory, which is also located within TRIC. So far, Blockchains, LLC has only used a sliver of that land, about half an acre of land, for offices that it unveiled for a group of local reporters on Wednesday. The tour of the 25,000 square-foot facility came one day after the staff moved in, said Sarah Johns, the company’s director of public relations. The building was completed in about four months using 15 Nevada subcontractors to remodel an existing building, Johns said. “We just finished moving in this morning,” she told reporters Wednesday afternoon. The company’s focus is developing applications that use blockchain technology, an alternative method for making transactions, where data is recorded into a permanent ledger that is open for its users and distributed across the internet. Bitcoin, the digital currency, is the most well-known application of blockchain technology, but it is being used in energy and even in journalism. The company does not revolve around bitcoin. Instead, it is using the Ethereum platform, a blockchain technology that allows users to build applications to, for instance, execute contracts or track goods in a supply chain. In the past year, it has drawn interest from startups and big companies such as BP, Deloitte, J.P Morgan and Microsoft. Wall Street has looked at blockchain as a way to make trading more direct and faster. Others, like energy companies, have seen it as a way to track complex transactions, such as energy production or tracking renewable credits. 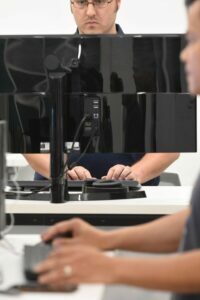 A developer working at Blockchains, LLC in the Tahoe-Reno Industrial Center on June 21, 2018. (David Calvert/The Nevada Independent). “With all of this land, we have the capacity and space to change the world,” Johns said. The joke about Silicon Valley and tech startups is that they are always talking about “changing the world,” often with software. Blockchains, LLC seems to embrace it. Aside the front door is a quote from Apple’s famous “Think Different” ad. At this stage, Blockchains, LLC can’t say much more about how they plan to “change the world” because of confidentiality agreements. Johns said the company will make more announcements about specific projects in the coming months. “We have plans to announce certain things down the road,” Johns said. Although it’s light on details, Blockchains, LLC is hiring. The company has hired just over 71 employees so far, she said, with a goal of hiring 1,000 employees by 2021. On its website, it lists a dozen open positions, including one posting for a chief operating officer and a few openings to fill a large, open-planned developer room. Unlike other companies such as Tesla, Blockchains, LLC did not get tax breaks to come to Nevada. Instead, Johns said a big reason for its decision to choose Sparks, right outside of Reno, was state Sen. Ben Kieckhefer’s bill last session to prohibit local governments from taxing blockchain. The CEO and owner, Jeffrey Berns, a California attorney whose firm has won class-action settlements against big companies like Ticketmaster, had considered starting the company in Washington. They changed course after the Kieckhefer bill passed last year in the Legislature, Johns said. Berns runs the company with his brother David Berns, also an attorney. This is not Berns’ first foray into the emerging world of blockchain and cryptocurrency. Berns’ legal practice runs a blog about the legalities of virtual currency and ran ETHNews, a news outlet covering Ethereum and ether, the cryptocurrency associated with it. That website is now part of Blockchains, LLC and is housed at the facility in Sparks. Johns said that the news site has editorial independence. There are also some investors in the company, Johns said. She could not comment on the construction costs for the facility but the company has already put down a lot of cash. Lance Gilman, the broker for TRIC, said in an interview earlier this year that he couldn’t give a price for the sale, but that the total value of land sales in January, the month that the Blockchains, LLC deal closed, came out to about $175 million for 74,000 acres. With the land sale in January, Blockchains LLC now owns nearly two-thirds of the land in the 107,000-acre industrial park. It has more than 100 tenants, including Google and Walmart. In a room close to the front of the facility, Blockchains, LLC has a client service center. The company would not disclose any of its clients or how many it had as it’s beginning to ramp up, but they define the customer-base broadly: anyone or any company who wants to develop programs on the Ethereum blockchain. The company said that it is open to developing any type of Ethereum program for clients and does not appear to be targeting a specific industry. 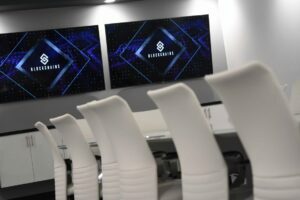 A conference room at an office for Blockchains, LLC in the Tahoe-Reno Industrial Center. (David Calvert/The Nevada Independent). Blockchains, LLC has ruled out the possibility of “mining” for cryptocoins. Programmers earn, or “mine,” cryptocurrency by using computers to solve increasingly difficult math puzzles. It requires a lot of energy and miners have flocked to areas where energy can be cheap, areas high in hydropower resources or near solar farms that produce excess energy in the day. The big question is what the company intends to do with all of its land. Blockchains, LLC has suggested that its facilities could serve as something of a research park — a place to incubate new technologies, working with Ethereum and collaborating with partners. Update: This story was updated at 10:06 a.m. on June 22, 2018 to indicate that Jeffrey Berns is the owner of the company. An original draft said that Berns and his brother were both owners. His brother is the company’s president. This story was updated again at 9:13 a.m. on June 24, 2018 to correct an error about what percentage of land the company owns at TRIC. Blockchains, LLC owns nearly two-thirds of the land in the industrial center, not one-third.